Western blot analysis of extracts from 293 cells, transfected with 100 nM SignalSilence® Control siRNA (Unconjugated) #6568 (-) or SignalSilence® CDK8 siRNA I (+), using CDK8 (G398) Antibody #4101 and α-Tubulin (11H10) Rabbit mAb #2125. 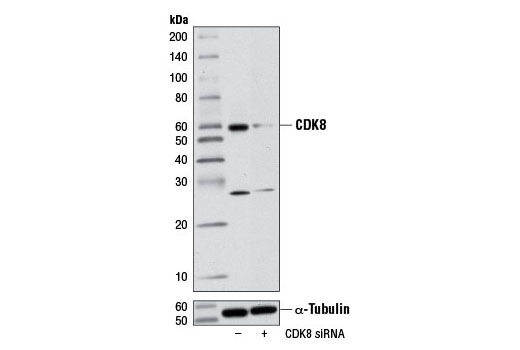 The CDK8 (G398) Antibody confirms silencing of CDK8 expression, while the α-Tubulin (11H10) Rabbit mAb is used as a loading control. CST recommends transfection with 100 nM SignalSilence® CDK8 siRNA I 48 to 72 hours prior to cell lysis. For transfection procedure, follow protocol provided by the transfection reagent manufacturer. Please feel free to contact CST with any questions on use. SignalSilence® CDK8 siRNA I from Cell Signaling Technology (CST) allows the researcher to specifically inhibit CDK8 expression using RNA interference, a method whereby gene expression can be selectively silenced through the delivery of double stranded RNA molecules into the cell. All SignalSilence® siRNA products from CST are rigorously tested in-house and have been shown to reduce target protein expression by western analysis. The mammalian Mediator Complex is a multi-subunit protein complex that couples specific transcriptional regulators to RNA polymerase II (Pol II) and the basal transcription machinery. Interactions between distinct Mediator subunits and transcription factors allow for specific gene regulation (reviewed in 1). Mediator complex interactions control various biological processes, including insulin signaling (2), NF-κB-dependent signaling (3), stem cell pluripotency and self renewal (4,5), and proliferation of colon cancer cells (6,7). CDK8/Cyclin C, along with Med12 and Med13, constitute a subcomplex within the Mediator Complex thought to act as a molecular switch, inhibiting Pol II recruitment and transcription initiation (8,9). Expression of CDK8 abrogates E2F-1-dependent inhibition of β-catenin activity in colon cancer cells (9). High levels of CDK8 coincide with high β-catenin-dependent transcription in colon cancer cells, and their proliferation can be inhibited by suppressing CDK8 expression (8). CDK8 can phosphorylate Ser727 on STAT1, which reduces natural killer (NK) cell toxicity (10,11). As such, inhibitors are being pursued as potential therapeutics to enhance NK cell activity and combat a variety of cancer types (12,13). Malik, S. and Roeder, R.G. (2005) Trends Biochem Sci 30, 256-63. Wang, W. et al. (2009) Dev Cell 16, 764-71.
van Essen, D. et al. (2009) PLoS Biol 7, e73. Tutter, A.V. et al. (2009) J Biol Chem 284, 3709-18. Varelas, X. et al. (2008) Nat Cell Biol 10, 837-48. Firestein, R. et al. (2008) Nature 455, 547-51. Morris, E.J. et al. (2008) Nature 455, 552-6. Knuesel, M.T. et al. (2009) Mol Cell Biol 29, 650-61. Knuesel, M.T. et al. (2009) Genes Dev 23, 439-51. Bancerek, J. et al. (2013) Immunity 38, 250-62. Putz, E.M. et al. (2013) Cell Rep 4, 437-44. Dale, T. et al. (2015) Nat Chem Biol 11, 973-80. Rzymski, T. et al. (2017) Oncotarget , .